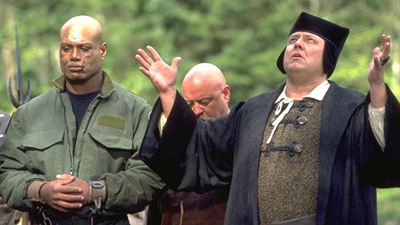 The SG-1 team discovers a Christian culture with Medieval European origins, but the inhabitants live in fear of their powerful Canon, and the demon who demands periodic human sacrifice. The "demon" is an Unas, gathering hosts for Sokar, but when SG-1 offers to rid the village of the threat, they themselves are condemned as evil and offered in sacrifice. Only Simon, a young man of the village, has the courage to defy the Canon and come to the aid of SG-1. With his help, the team is able to defeat the Unas and its Goa'uld symbiote, and free the village. The villagers, an early Christian culture using pre-Chaucer English, were probably taken from Medieval Europe through the Antarctic gate. The Canon is the spiritual leader who chooses the sacrifices, uses a ring handed down by generations of village canons to summon lightning, and forbids the villagers to look upon the Circle of Darkness. SG-1 has taken the ring, and the villagers will bury the gate. Unas is a species, the first hosts of the Goa'uld. Unas visited the village as a demon, in the service of Sokar, in the role of Satan, claiming human sacrifices to be used as host bodies. The trepanning ritual is a procedure often done in the Middle Ages in which a hole would be drilled into a person's head so that the evil spirits are released, thus saving the person from eternal damnation. The tests of witchcraft include the Mark of the Devil, in which a mark on the body is insensitive to pain, and the Water Test, in which a victim who floated was guilty and burned at the stake, and one who drowned was innocent. Teal'c survived drowning by putting himself into a deep state of kelno'reem, during which time the symbiote, in its natural environment, filtered the oxygen from the water and fed it to Teal'c. Peter DeLuise cameo: the villager calling "The demon comes!"